While the 360 sound factor is nothing new for bluetooth speakers; many brands like Ultimate Ears and JBL have been offering similar products with the main goal to facilitate placement of the speaker, promising full audio output on all sides of the speaker. However, this doens't seem the easiest task as most speakers I've heard until now perform worse than their straight counterparts, producing an overall flat sound. The UE Megaboom and JBL Flip 3 did better than average in my opinion. Bose introduces a new 360 speaker carrying their popular soundlink nametag, this makes that the speaker's name rings a bell for many people. There are actually two speaker with a different size, the one we're testing today is the biggest one indicated by the '+' in the product's name. Both of them are water resistant and feature a lantern-like design. Bose has never been the cheapest audio brand and continues this norm in their new series averaging at a good 320 Euro for the big one and 230 Euro for the smaller Revolve speaker. The speaker is well packaged in a special box including usual quick manual, warranty information and charger. Additionally, Bose offers an easy charging plaform for an extra 30 euro (which isn't really worth it, especially at this price point). We're still waiting for companies to include AUX cables as a norm. Both speakers come in two colours; black and light grey. The design of the speaker is comparable to a lantern, the plus version even has a handle to carry it arround. As far as my artistic feeling goes, it's something you need to get familiar with, but gives a nice premium feeling. A sandy exterior gives a mixed appearance between matte and shiny. Rubber on top and bottom protect the speaker against the most critical drops. The speakers are splash resistant, but can't withstand more than that. We're not allowed to test the structural stiffness of the speaker, but we're pretty sure the speaker is in between firmness of the UE Megaboom and previous SoundLink III. The speaker exists of a downfiring full-range driver, a omnidirectional deflector at the bottom and a double passive radiator on the side which insures premium 360 sound. On the top ponel, there are some controls including power button, channel select, bluetooth pairing, volume control and pause/play button. The power level is said by a voice and can be called upon on any moment pressing the power button shortly. Bose has a deep sound signature with a noticable bass boost in sub-bass tracks. Even on lower volume levels, the presence of the bass is pretty noticable. In comparison to Skullcandy's Barricade XL, there's no distortion at max volume and remains balanced on all volume levels. While the sound signature is more to the bassy side, they keep it more linearized than skullcandy. The speaker delivers a deep and warm sound which can easily boost up the party inside or outside. Due to the downfiring driver and rubber bottom, the speaker has good grip for heavy bass tracks. Most speakers need the right placement to boost the bass performance (like in a corner or against a wall), otherwise they sound flat... for this speaker this is certainly not the case. Even on the go carrying the speaker with the handle we heard good bass presence. In some bluetooth speakers with over extended bass response, we get a muddy sound, forgetting about high-mids and totally abandoning clarity profiles. This speaker does not desert these audio standards with firm high-mid sound profiles to back the bass boosted profile. This way clear vocals and subtle guitar strums remain like they were meant to be played. In terms of volume, it easily matches other bluetooth speakers in this category like the JBL Xtreme, UE Megaboom or KEF MUO and probably goes even louder. The Bose Revolve+ delivers a richer sound in general. In terms of battery life, Bose states that the speaker can play for 16 hours without problem, depending on your volume settings. We used the speaker fully charged at a moderate volume setting of ~70% and we were able to play for just over 11 hours of music non-stop which is excellent. This however, is a little less than the UE Megaboom we tested some time ago. This speaker is a performer, not only in audio, but also its battery life is great. It has a neat design while the structure is pretty firm. 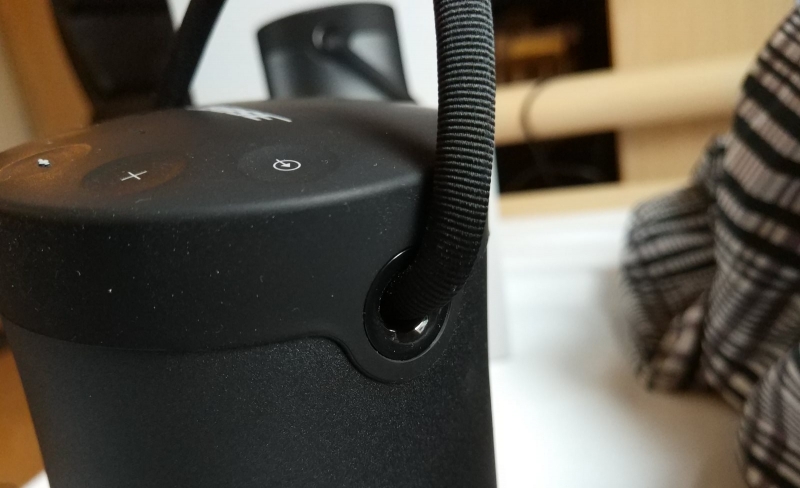 The attached handle makes the speaker is easy to carry around. While it's probably not as robust and water resistant as the UE Megaboom or SkullCandy Barricade XL, Bose's offering definitly has the better looks. With its lantern-like design, it's the first speaker using this formfactor. For me this is probably the best sounding speaker of its price category, in comparison to its predecessors the soundlink mini II & soundlink III, the soundlink Revolve has more refined sound with a better balanced signature. A well earned Gold Award for the Bose Soundlink Revolve+. Keeping up with new inventions and technological improvements is kinda my thing. Writing about technology is just a result of my fascination with it. I hope to provide readers with as much news as possible, everyday.